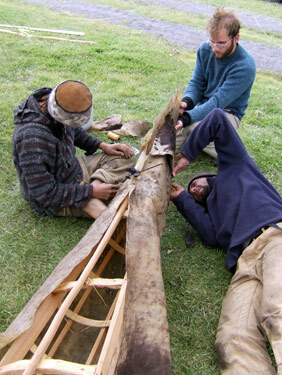 In 2006 and 2007, Kiliii Yu of Seawolf and Brian Schulz from Cape Falcon began a unique project– The construction of a driftwood-framed kayak with hide covering. We finished it and skinned it traditional Greenland-style. The kayak Anqeti made the front cover of the November 2008 Bulletin of Primitive Technology. The article is reprinted below. When I first pulled the fitted skin over the ribs of Ahnkuttie (on-ka-tee), my Hide-on-Frame Qayaq (kayak), I could not help but marvel at the resemblance to a marine mammal. The ribs glistened and the skin breathed with wind gusts. A community of helpers and I had breathed life into a true qayaq outside of the arctic and sub-arctic regions for probably the first time in history. 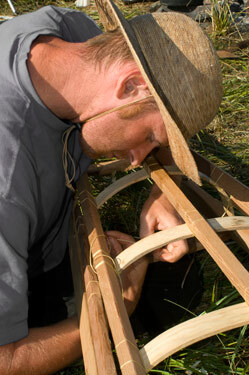 The project to construct a traditional-style hunting qayaq began in 2006. 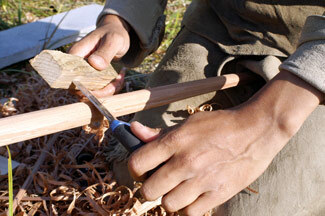 It excited me to try working with traditional construction methods for building both the framework and the skin sewing. The frame construction happened in a straightforward manner, but in the skin sewing I tackled many mysteries of the techniques that are today on the verge of extinction. 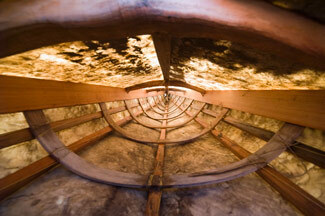 Currently in Greenland and the Aleutian Islands a resurgence of interest traditional kayaks is blossoming, but preciously few original skin-sewers remain, and to date all documented materials that kayak historian Harvey Golden or I know of have not nearly enough detail describe the process. 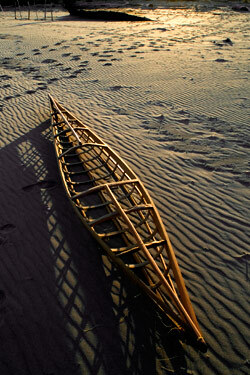 To start, I teamed up with fiend and skin-on-frame designer and builder Brian Schulz of Cape Falcon Kayak. We chose to construct a West Greenland-styled frame partially of driftwood and partially of rejected scraps from his kayak shop. 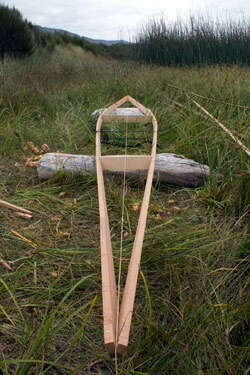 By using milled lumber for the gunwales (the primary longitudinal members of the framework), we reduced the time to construct our qayaq frame considerably. Brian and I set up on Nehalem Point, at the end of jetty in a marshy area. We kayaked in and brought only a few steel hand tools. In the end we primarily used a knife, a hatchet, and a few hand saws to do all the shaping work on the frame parts. 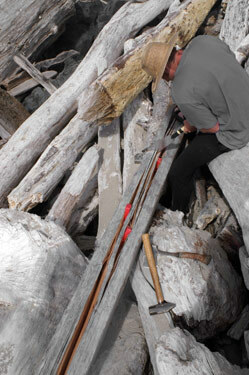 I set the frame up on top of two driftwood logs, and then Brian and I went searching for curved grain Western Red Cedar knees so that we could split out arched deck beams (transverse members that hold the gunwales apart). Once we located some curved grain tree driftwood stumps, I split out several arched 24” pieces, taking care to remove all the damaged and salted wood from the outside of the log. We located cedar easily due to its unique longitudinal checks from weathering. 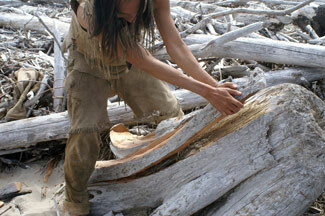 We also located some old-growth cedar logs from which we were able to split out stringers and a keelson. I shaped nearly all the wood with my knife pounded into a block of wood to make a drawknife. With a series of forms, we spread apart the gunwales with an appropriate amount of flare. This set the rocker (the upward curve of the ends) and the stage for the ribs, which determined the hull shape. Then I set the deck beams on the gunwales and marked their intersection areas. 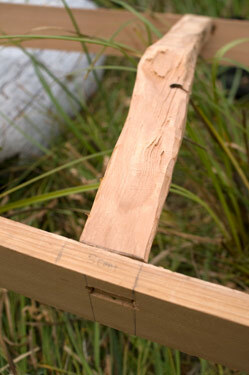 Using hand saws, we cut tenons (pegs) on the ends of the deck beams, which had been marked for the complex angles. We then drilled out and chiseled the mortices (slots) for the deck beams by drilling with an eggbeater-style hand drill. For the bit, I shaped a brass nail by pounding it flat on the tip into a diamond-shaped pumpdrill-style bit. With the deck built, we turned out attentions to the ribbing. With this project, we chose to steam-bend our thin rectangular cross-section oak ribs. In later projects, I used cold-bent green willow and hazelnut shoots, also to great success. 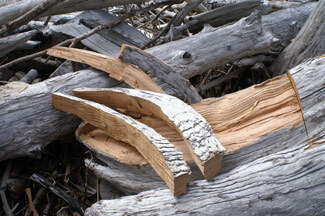 Steaming the ribs with saltwater for twenty minutes, the ¼” oak became quite pliable. 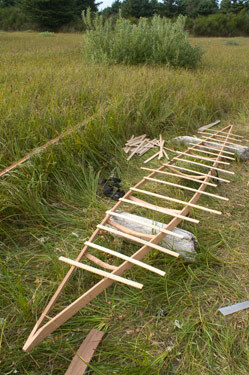 Brian and I then backed each rib with an old belt and bent the ribs to shape by hand. The entire steaming process took only an hour, as the rib lengths were already predetermined and measured. For comparison, I fit future cold-bent ribs individually, and the ribbing process jumped to two full days. As the ribs went into place and the stringers were ready to be placed, we took a great deal of time to sight down the qayaq’s hull to anticipate hull shape when stretching the skin over the frame. At last Ahnkuttie’s framework was ready to be lashed together. In the past, I experimented with primitive lashings for the framework a good bit. I found sinew, used traditionally, to be the easiest and tightest lashing to work with, as compared to rawhide, buckskin thong, and dogbane cordage. Unfortunately, a full qayaq’s worth of lashing is easily 400 yards, and making it would have doubled construction time. In lieu, I chose to use waxed nylon cord and lashed the keelson and stringers on each with a single continuous lashing, as was often traditional by Greenland Inuit. 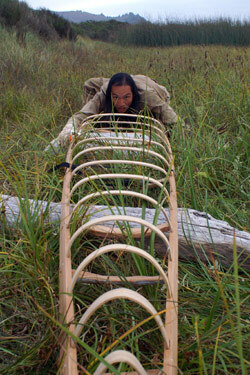 With the framework essentially completed, Brian paddled Ahnkuttie’s skeleton back home on top of an Aleut double qayaq and I brought the frame to the Rabbitstick Rendezvous in September 2006. The skeleton had only taken four days to complete, much quicker than either of us had anticipated! Undoubtedly having pre-milled gunwales and ribs and a huge selection of driftwood (compared to Greenland) greatly reduced the traditional construction time of a year. When looking for appropriate hides to skin the qayaq, I ran into some difficulty, as I was restricted from using the traditional marine mammals. 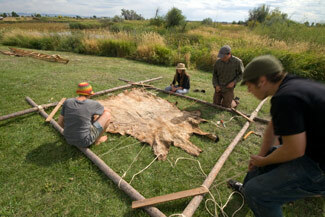 In the end, I chose to use two ‘land walrus’ or cow hides where I supervised the skinning of to ensure no holes. I then wetscraped the hair off both hides over three days. The hair was very difficult to scrape as I chose not rot the hides at all. I hoped this would prevent the grain (epidermis) from splitting or being damaged. 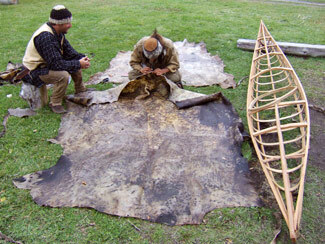 The next step involved the time-consuming and laborious stage of thinning the hides before sewing. 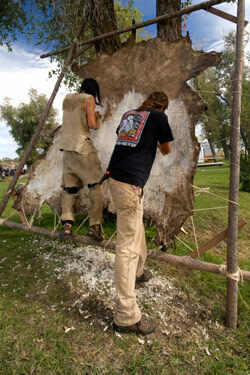 Many at Rabbitstick including Thaddeus Koster, Patrick Farneman and Kyle Chamberlain aided me extensively in racking the hides and dryscraping the flesh sides to achieve a ½” hide. Traditionally, women split walrus skins, which are also quite thick. Without any information of how the technique, however, we simply chose to thin slowly. This may have ended as a mistake, creating a thicker hide than necessary, which likely contributed to the eventual demise of Ahnkuttie’s framework. 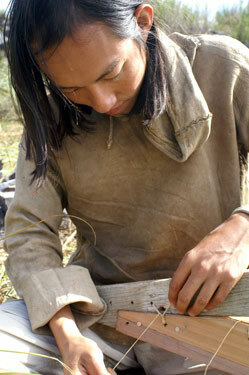 Once we had thinned the hides and soaked them sufficiently, I began sewing the skins. I tried sewing using many different methods, but ended up using a glover’s needle to pierce the thick hide. 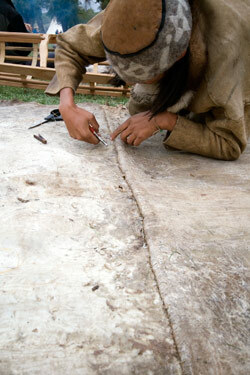 Inuit skin sewers usually sewed subcutaneously, or only partially through the thick hide. This prevented putting any holes in the hide. I could not figure how to efficiently sew a subcutaneous stitch with my tools, so simply sewed the first stitch of the traditional waterproof seams by piercing the entire hide. With the second stitch of each seam I sewed the more time-consuming subcutaneous stitch using a curved needle that I sharpened similar to a glover’s needle tip. Usually, one sews a waterproof seams twice. The first time is typically a running stitch that pulls the two pieces together. Then you fold the overlapping skin twice and sew the flap down to one side. The first seam we sewed, which put the two cowhides together into one large rectangular piece, was quite bulky. Looking back, I would say that the bulkiness came from the particular seam style, the flat seam. In future projects, I will likely use a single overlap transverse seam. To get enough length to completely skin our 16’ frame (somewhat short by traditional standards), I had to sew three seams and patch in two pieces at the bow and stern. With the skin in one piece and laid under the qayaq framework, I gathered a team of strong people to bring the hides together around the frame, intersecting along the top deck. I then sewed ‘pins’, or lashings at intervals along the top deck to hold the skin tight against the frame. With these pins in place, I could then take my time and sew the final seams slowly. The amount of force used in tightening the skin and the final tightness of the skin turned out to be a significant mistake. Weeks after the final skinning of the boat, the hides shrank enough to begin distorting and crushing the frame. Over a year and many wet-dry cycles the hides eventually crushed the ribs in and distorted the frame enough cause the qayaq’s performance to change. Today Ahnkuttie is retired, the first prototype in reviving an advanced technology soon to be lost. When the skin was completely sewn, I then proceeded to drill through the skin and the gunwales to thread rawhide deck lines across the top deck. 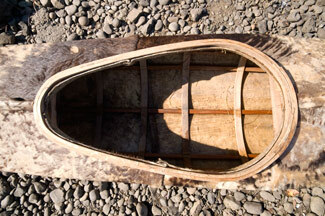 These are used to hold paddles and hunting equipment on a qayaq’s deck. I replicated a traditional deck with bone toggles, and have found them to be an excellent setup, particularly in regard to setting up paddles as temporary outriggers to stabilize the boat. To finish the skin, I then took a sharp knife and dryscraped the remaining hair off the boat’s hull. 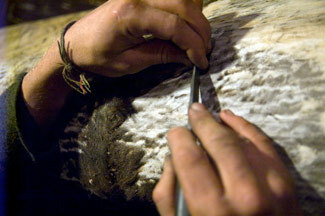 This process consumed a lot of time due to the thick and tough cow hair. Now came the time for waterproofing. 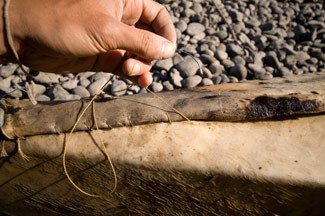 Inuit peoples almost always used seal oil or other animal blubbers to seal their qayaq skins. Without sufficient animal fats, I substituted pure linseed oil, coating the hull in six coats that took two months to fully dry. I coated only the exterior, and have a difficult time imagining how to coat the interior. We completely built a traditional West-Greenland qayaq and now needed to launch it into the ocean! 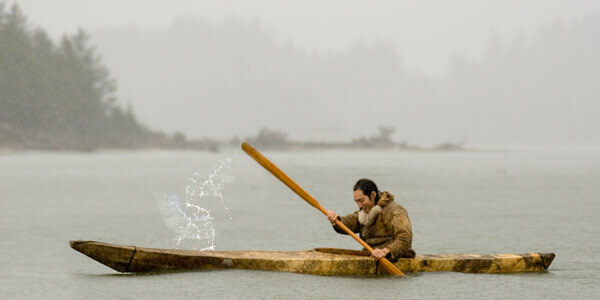 I took Ahnkuttie to Nehalem Bay, where I originally collected his driftwood bones and set him in the water for his animation. 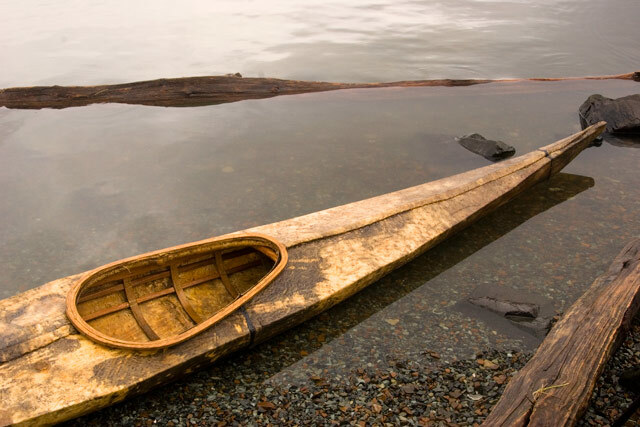 He floated and with some temerity, I fitted myself into the qayaq, sitting atop a wolf hide along the inside of the frame for insulation against the cold water. I took my Greenland paddle and raced swiftly across the bay. Ahnkuttie performed indeed every bit as well as our other skin-on-frame kayaks, also on the water that Winter Solstice. He tracked well, edged and maneuvered well, and displayed a minor amount of leaking—about gallon an hour, from the center hull seam. Overall, I learned a great deal from building Ahnkuttie. He took a total of about 300 man-hours to complete, from start to finish, and in the end weighed about 40 pounds. Today the knowledge I gained from Ahnkuttie’s animation is invaluable, and I hope will go a long way towards the goal of interlinking the Qayaq with subsistence foraging once again. this looks like so much fun, excellent article! What a beautiful, graceful, elegant kayak! I love its translucence. The article is wonderful, and the photos really tell the story. Nice work! Well Done Kiliii and friends – this is so totally awesome and inspiring – I apreciate the patience you have to use this "time intense"
method of skinning. But then again – what better use of one's time? We're experimenting with canvas and linseed oil paint – with the eventual idea of using local hemp fibers for the canvas. I've got to go check out the rest of your wonderful website. Good job guys! Very amazing work! You're the best, Kilii. Missing you! Amazing Read… I stumbled upon your site this morning and I have been stuck reading blog posts for two hours. Congratulations, a really great achievement ,well done. to join it. Is there anybody having identical RSS problems?